Eastman Kodak introduced 16 mm film in 1923 as a less expensive amateur alternative to 35 mm film. During the 1920s, the format was often referred to as sub-standard by the professional industry. Kodak hired Willard Beech Cook from his 28 mm Pathescope of America company to create the new 16 mm Kodascope Library. In addition to making home movies, people could buy or rent films from the library, a key selling aspect of the format. Intended for amateur use, 16 mm film was one of the first formats to use acetate safety film as a film base. Kodak never used nitrate film for the format because of the high flammability of the nitrate base. 35 mm nitrate was discontinued in 1952..
16 mm film is a historically popular and economical gauge of film. 16 mm refers to the width of the film, with other common film gauges including 8 and 35 mm. 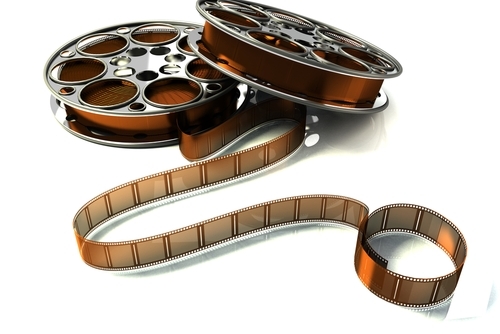 It is generally used for non-theatrical (e.g., industrial, educational) film making or for low budget motion pictures. It also existed as a popular amateur or home movie making format for several decades, alongside 8 mm film, and later Super 8 film. In 1923, Eastman Kodak released the first 16 mm "outfit" consisting of a camera, projector, tripod, screen and splicer for $335. RCA-Victor introduced a 16 mm sound movie projector in 1932 and developed an optical sound-on-film 16 mm camera, released in 1935.